It hasn’t been a very good weekend. Rick’s jeep is in the shop and will be there for a few days. We got it there just before closing on Saturday, at least it didn’t need to be towed. It is also overcast and cold for June. Now I noticed I have to frog quite a bit of one on my socks too. I must have lost my concentration and knit where I should have done YOs and didn’t notice. I feel so stupid when I do things like this. I need to learn more about putting arrows on photos. I got the arrow, but couldn’t figure out how to angle it, or move it after it was placed. I also had trouble taking the photo. It has just been not a very good weekend. 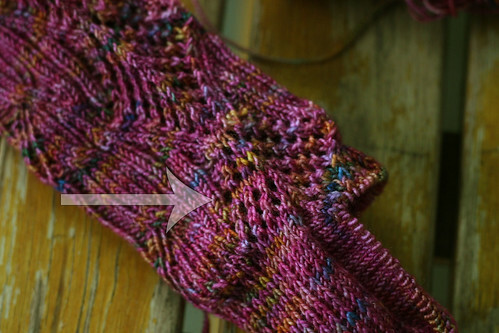 This entry was posted on Sunday, June 7th, 2009 at 3:00 am and is filed under Knitting. Tagged: Knitting. You can feed this entry. You can leave a response, or trackback from your own site. It’s been pretty cool here in Florida too. I went to dinner with friends on Friday and we actually sat outside. Then last night we were at a party and sat out to eat then. Very unusual for Florida this time of year. I’m enjoying it! Sorry about Saturday not being a good day. One more day left of the weekend today though and I’m hoping it’s a good one for you! Oh! I hope next week is better.